SOMETIMES YOU CAN JUDGE A BOOK BY its cover. 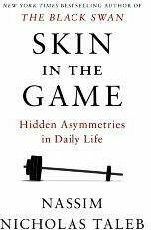 The image under the title of Nassim Nicholas Taleb’s new book, Skin in the Game: Hidden Asymmetries in Daily Life, presents the would-be reader with a barbell holding large weights on one side and smaller weights on the other. The mixed metaphor (one might expect to see a reference to skin and/or a game) sets the tone for an uneven book that’s heavy on personal attacks and vendettas but light on substance. Taleb achieved authorial fame with 2008’s Black Swan, and followed that work with Antifragile in 2012. The first book showed how models based on predictive analytics can fail dramatically when unlikely events occur that crash the system. It became popular in no small part because of the financial crisis in the housing sector that occurred the same year. It’s not clear what the connection was, though, since the housing crash came as a result of consistent flaws in the lending system and not as a singular unlikely event. Antifragile put forth the thesis that universities exist to formalize ideas and processes that actually evolved in the wild where real people work. What Is It like to Be a Human? The Inevitability of Intelligent Life? 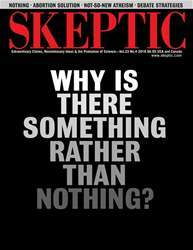 SKEPTIC MAGAZINE back issues $6.00 ea.